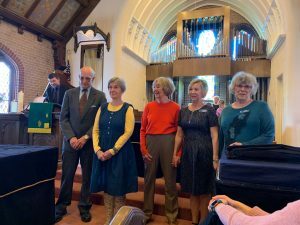 First Presbyterian of Littleton ordained and installed a group of new elders and deacons at a ceremony conducted in conjunction with our Annual Congregational meeting on January 29, 2019. New elders committed that they will each be a faithful ruling elder, watching over the people, providing for their worship, nurture and service. Additionally, they share in government and discipline, serve in councils of the church, and in their ministry will try to show the love and justice of Jesus Christ. New deacons committed that they will each be a faithful deacon, teaching charity, urging concern, and directing the people’s help to the friendless and those in need, and in their ministry will try to show the love and justice of Jesus Christ. Contact the church office if you are interested in serving in one of these incredibly important and rewarding roles. « Don’t Miss Our Annual Congregational Meeting on January 27th!